Emergency departments are one of the highest risk areas in health care. Emergency physicians have to assemble and manage unrehearsed multidisciplinary teams with little notice and manage critically ill patients. With greater emphasis on management and leadership skills, there is an increasing awareness of the importance of human factors in making changes to improve patient safety. Non-clinical skills are required to achieve this in an information-poor environment and to minimise the risk of errors. Training in these non-clinical skills is a mandatory component in other high-risk industries, such as aviation and, needs to be part of an emergency physician's skill set. Therefore, there remains an educational gap that we need to fill before an emergency physician is equipped to function as a team leader and manager. This review will examine the lessons from aviation and how these are applicable to emergency medicine. Solutions to averting errors are discussed and the need for formal human factors training in emergency medicine. The ambulance alert phone rings, ‘5 year old, hit by a car, multiple injuries, distressed and combative, assisted ventilation in progress, no venous access, ETA 7 minutes’. This situation is familiar to emergency physicians. As team leader, the emergency physician has just a few minutes to assemble a multidisciplinary hospital team and then manage and coordinate the team's efforts in this challenging and probably terrifying clinical situation. Within a few minutes the resuscitation room will fill with paediatricians, anaesthetists, surgeons and orthopods, a radiographer or two, additional emergency physicians together with emergency department (ED) and paediatric nurses. These clinicians will be of varying seniority. The team leader may not have worked with these clinicians before and will not know how they work under pressure or what their skills in trauma might be. Each clinician in the hastily assembled trauma team will have their own priorities and anxieties. The anaesthetist may start going through airway equipment and will ask for drugs to be prepared. He may be very concerned about delivering a rapid sequence induction in a small, multiply injured child. Junior paediatricians will busy themselves preparing cannulas and asking for blood bottles. One of them will probably be completing a ‘WETFAG’ chart on the whiteboard. The surgical members of the team may have anxieties about their ability to operate on a child. The few nursing staff present will be inundated with requests from the medical team members well before the patient has arrived. Those team members who have not found anything to do during this preparation phase will be shuffling nervously, fiddling with equipment on trolleys or just adding to the general noise. The resus room will be noisy and busy and we have not received the patient yet. After the child is delivered by ambulance, the team will be exposed to the visual impact of a multiply injured child. Some team members will immerse themselves in different parts of patient assessment, while the ambulance crew struggle to give a handover to a team that is too busy to listen. Nursing staff will be connecting the child to monitors. Several team members will try to soothe the child loudly and ineffectively while a paediatric nurse engages with the child’s parents. Once the team have started to assess the injured child, requests for equipment and assistance will escalate, as will the general noise level. Each specialty representative will have their own clinical priorities. The surgical team may insist on a CT scan before a surgical decision. The anaesthetist may be reluctant to deliver an anaesthetic before a surgical decision. A radiologist may suggest plain films before CT.
To provide effective clinical leadership in this situation, the team leader needs to develop a certain set of non-clinical skills. This situation demands more than currency in advance paediatric life support or advanced trauma life support; it requires the confidence (underpinned by clinical knowledge) to guide, lead and assimilate information from multiple sources to make quick and sound decisions. The team leader will encounter different personalities, seniority, expectations and behaviours from members of the team, each of whom will have their own insecurities, personality, anxieties and ego. Our team leader will need to be able to assert, negotiate, compromise and steer the team towards the rapid and effective delivery of high quality care. This is a situation that invites errors and inefficiencies, which need to be predicted and averted. Emergency physicians have to function in multidisciplinary clinical and non-clinical environments. At one extreme is the need to assemble and lead an unrehearsed, rapidly assembled clinical team to manage a critically ill or injured patient. However, medical leadership extends to more than managing a multidisciplinary team for a severely injured child. In more routine emergency medicine work, the emergency physician has to negotiate, agree and implement a multitude of clinical pathways and management arrangements across a range of different clinical specialties and management teams within a hospital. Therefore, the emergency physician needs to develop sound team leadership and also team membership skills for the clinical and non-clinical elements of their role. The skills required to manage the unrehearsed, multidisciplinary clinical team are transferable to the less urgent challenges of working with multidisciplinary clinical and non-clinical colleagues in the health service. By teaching Emergency physicians to manage the ‘worst case scenario’, we are likely also to prepare them for working well and effectively in these less urgent challenges. In many ED, nurses with extended skills play an active role in team leadership and critical team decisions. There is therefore a need to involve our nursing colleagues in human factors training and it is time for our specialty to explore ways of delivering this training. The importance of these human factors is well versed in aviation and is exemplified statistically with an estimated 75% of aircraft accidents or incidents being attributed to human error,3 prompting the National Aeronautics and Space Administration (NASA) to identify the human error aspects of air crashes. How do errors occur? What factors contribute to safety and efficient human and organisational performance? To answer these questions, we must first understand what is meant by human factors. In his book, ‘Managing the risks of organisational accidents’, Reason6 proposes two approaches to the problem of human fallibility: the person (individual) and the system (organisation), and points out that accidents that can be attributed to both are central to the human error problem. In his ‘Swiss cheese’ model, Reason7 represents failures as holes in the layers of defence, which when they all line up, result in an accident. The holes are the result of active failures made by people and also the latent conditions of the organisational system (figure 1). The aim of human factors training is to build defensive layers to avert errors or mitigate their effects. One way of reducing human factor errors is crew resource management (CRM), an area that has become an integral part of aviation training and operation. CRM, as exemplified in commercial aviation, uses an error management system to reduce the incidence and consequences of human error in aircraft accidents to a minimum. It was developed as a response to new insights into the causes of such accidents. Information from flight and cockpit recordings suggested that a large proportion of air crashes resulted not from technical malfunctioning of the aircraft but from non-technical errors such as inadequate communication between crew members, loss of situational awareness and ultimately to wrong decision-making with adverse consequences.10 CRM emphasises the role of human factors in high-stress, high-risk environments and its principles appear relevant to emergency medicine. The ED is perhaps the most stressful and challenging hospital setting with regard to patient safety; its unique operating characteristics (box 2) make it a natural environment for studying error. Courses such as advanced life support, advanced trauma life support and other ‘acronym’ courses have been developed to ensure that all members of the ‘acute‘ team are working to the same clinical guidelines. These have become ‘must have’ tickets for emergency physicians. While the emphasis on these courses is on clinical skills and aspects of teamwork and leadership are acknowledged, specific non-technical skills are not comprehensively addressed in these courses. There therefore remains an educational gap that we need to fill before an emergency physician is equipped to function as a team leader and manager. 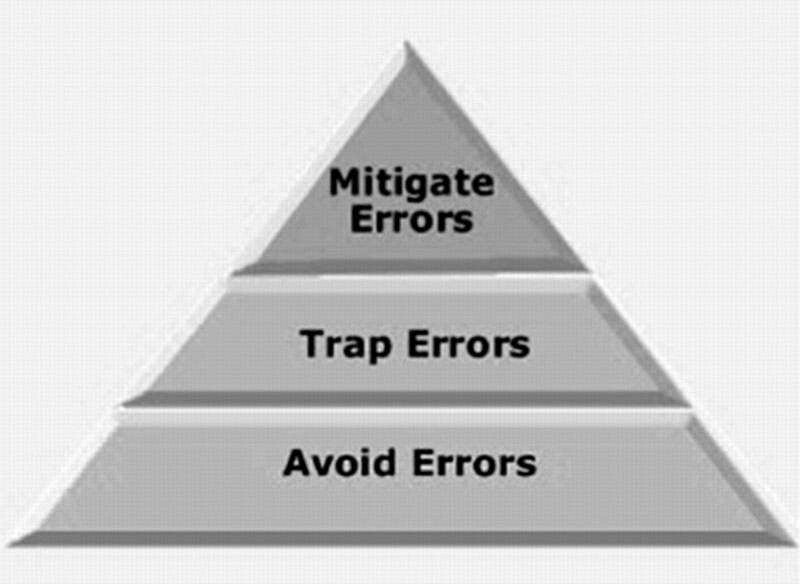 Human factors training is the starting point for providing the basic framework of CRM ideas, and currently all front-line staff in aviation are made aware that systems (however finely tuned) are error-prone but with well-honed error management strategies in place, system failures and individual errors can be trapped by a well-trained team (the error management troika). In aviation, the use of flight simulators such as line-orientated flight training has become increasingly important in training crew members and allowing them to learn and practice CRM.13 Line-orientated flight training is a real-time flight scenario designed for pilots not only to practise line operations, but to test the non-technical skills of the whole crew. Similarly, this important training tool and the increasing availability of high-fidelity simulators in emergency medicine have enabled these skills to be delivered to healthcare professionals. These occur when a normally automatic process has to be consciously over-ridden. We can teach people to recognise when these situations arise and provide them with the tools to avoid error. This is where human factors training starts. There have been attempts to avert errors in medicine. In January 2009, the national patient safety alert advised that it was mandatory for all trusts to implement the WHO surgical safety checklist from February 2010, with the aim of improving communication and teamwork and thus identifying safety issues and preventable problems. In a New England Journal of Medicine article published in 2009, Haynes and colleagues16 demonstrated that the use of a 19-item safety checklist carried out in eight different hospitals spanning the globe reduced operative complications from a baseline of 11% to 7% and inhospital death rates from 1.5% to 0.8%. As with briefing and debriefing, the checklist, if used appropriately, can open up lines of communication by creating an environment in which each member of the team feels free to speak out, thus preventing important checklist steps from being missed out and preventing an error. In the UK, the National Patient Safety Agency advised trusts on the implementation of checklists.17 Trusts have implemented checklists in a variety of ways ranging from the development of training initiatives for theatre staff to mass email delivery. However, a checklist is just one element of a human factors approach to safety and efficiency. As a stand-alone tool it will add little value unless supported by an overall understanding of human factors and team dynamics by the team using it. The introduction of a checklist in isolation is likely to meet resistance and fail. It needs to be integrated into routine work patterns and the benefits explained to a team who have undergone training in team function, team leadership, team dynamics and behaviour management. This will often require a culture change. Minor errors are trapped preventing major errors. Communication tools such as situation, background, assessment, recommendation have been increasingly used to improve team communication by making conversations more succinct providing greater clarity of information and expectations of the actions required. This is a particularly useful communication tool when used to express concerns about the deterioration of a patient and can be used to structure further conversations. Red flags indicating loss of situation awareness. In aviation, briefings are a ‘must-do’ not an optional extra. They are performed before every take-off and every landing. They serve to share the plan for what should happen, what could happen, to distribute the workload efficiently and to prevent and manage unexpected problems. So how could we fit briefings into emergency medicine? Even though staff may be reluctant to leave the computer screen in a busy department, it is likely to be worth assembling the team for a few minutes to provide some order and structure to a busy department and plan the shift. At the end of the shift a short debriefing is useful to thank staff and identify what went well and what did not. Positive outcomes and initiatives can be agreed. Briefings and debriefings should also be undertaken before and after complex team actions. This is particularly useful in the resuscitation room. In aviation the use of high fidelity simulation allows researchers to observe and analyse teams under the most stressful of situations. Humans (however expert, dedicated and professional) will make errors and violate rules. We need to train our staff to understand when and why error is more likely to occur, and empower the team to trap or mitigate these errors. High fidelity simulators are becoming increasingly available in medical training and, therefore, we can now deliver effective human factors training in the appropriate and most useful training environment, centred around clinical scenarios. At present, there is no formal training in emergency medicine to improve team function. Currently, CRM is not a standard part of training in emergency medicine and, despite some research, there is no clearcut evidence that it improves patient outcome, and large numbers would be needed for such a study. Nevertheless, we do know that human factors training is an integral and accepted part of aviation training and in other industries where there is high-risk activity and in which human errors can lead to adverse events. If it works for them, it should work for us. To improve patient safety in the ED, the principles of CRM and its application must be supported by decision-makers and accompanied by organisational improvements. Although CRM/human factors training is a relatively new concept in emergency medicine, its role in preventing errors and improving safety in other specialities is well recognised, particularly in anaesthesia and critical care. With the ED posing similar levels of risk, it is time to embrace this concept and improve patient safety. The College of Emergency Medicine has sponsored a number of courses and educational initiatives to explore the introduction of formal ‘must-have’ training in team leadership skills for the emergency physician of the future. It is anticipated that emergency physicians will have to get another ‘acronym’ ticket in medical leadership in addition to the standard ‘acronym’ life support courses. The results of these trials will guide our specialty towards selecting and introducing the most appropriate and effective methods of training emergency physicians to meet the challenges of leading the service in an error prevention culture. NHS Institute for Innovation and Improvement and Academy of Medical Royal Colleges. Medical leadership competency framework: enhancing engagement in medical leadership, 2nd ed. Coventry: NHS Institute for Innovation and Improvement, 2009.
, eds; Committee on Quality of Health Care in America, Institute of Medicine. To err is human: building a safer health care system. Washington, DC: National Academy Press, 1999. Bond Air Services. Helicopter emergency medical service crew member training course manual: crew resource management. Gloucester. Bond Air Services, 2002. Civil Aviation Authority. CAP 719 Fundamental human factors concept. London: Civil Aviation Authority, 2002. Health and Safety Executive. Human factors/ergonomics – health and safety in the workplace. [homepage on the internet]. London: HMSO. http://www.hse.gov.uk/humanfactors/introduction.htm (accessed 18 Jul 2010).
. Managing the risks of organisational accidents. Aldershot, UK: Ashgate Publishing Limited, 1997. Patient Safety First. The ‘How to guide’ for implementing human factors in healthcare. London: Patient Safety First, 2009. Civil Aviation Authority. CAP 737 Crew resource management (CRM) training. Guidance for flight crew, CRM instructors (CRMIS) and CRM instructor-examiners (CRMIES). London: Civil Aviation Authority, 2003.
. Crisis management in anesthesiology. New York: Churchill Livingstone, 1994.
. Human performance and patient safety. In: Miller RD, ed. Miller's anaesthesia, 6th edn. Philadelphia: Churchill Livingstone, 2005:3021–72. , eds. NOTECHS. The evaluation of non-technical skills of multipilot aircrew in relation to the JAR–FCL requirements. Final report NLR-CR-98443. Amsterdam. National Aerospace Laboratory (NLR), 1998.
. Development of the NOTECHS (nontechnical skills) system for assessing pilots' CRM skills. Hum Factors Aerospace Saf 2003;3:95–117.
. Mid Staffordshire: where to from here? [editorial]. Emerg Med J 2009;26:470. National Patient Safety Agency. WHO surgical safety checklist. London; 2009. Available from http://www.nrls.npsa.nhs.uk/resources/?EntryId45=59860 (accessed 14 Jan 2011). Competing interests AB, TD and SB have been awarded a grant to provide a pilot course in human factors training by the College of Emergency Medicine. TD is Director of Atrainability Ltd. SS: none declared.